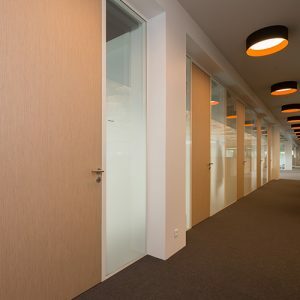 With its contemporary lines, the H9B pencil line partition has a perfect finish without cover-trim between boards. Removable, this partition is closely similar to a classic wall. Quick and easy to install, differents smart fixings have been developped to adapt according to the installation environment. All our partitions take full advantage of CERFF certification to ensure a safety maximum. The majority of our partition are traverse load certified. we are committed to the ISO 9001 certification, recognized standard to ensure the highest level of products and services quality. We offer a wide range of partition systems for the commercial and industrial sectors. Our products can be adapted to all needs including aesthetic, technical and pratical layout requirements. 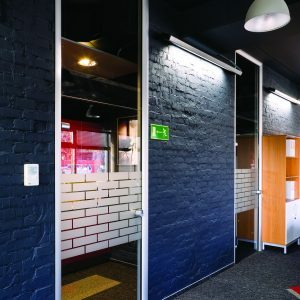 Specifically designed to be integrated in a dry partition, the Bati’H is an aluminium frame enabling all sorts of doors to be incorporated in order to harmonise your set-ups with the greatest of ease. From the most classical to the most specific, hOyez offers you a wide selection of doors in terms of materials and finishes. This choice of multiple configurations facilitates the integration of the door units in your partition systems.